After our desert adventure we split up with Sabine who went back to Marrakech to meet up with Red. 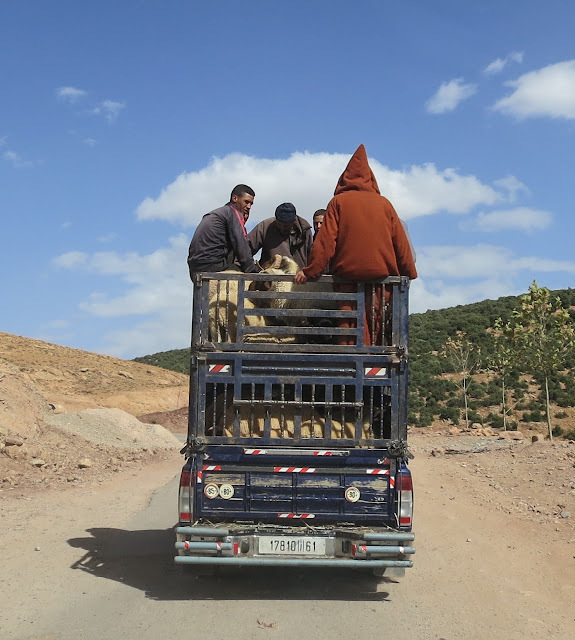 Jerome and I went with the driver and drove all the way across the center of Morocco up to Meknes. 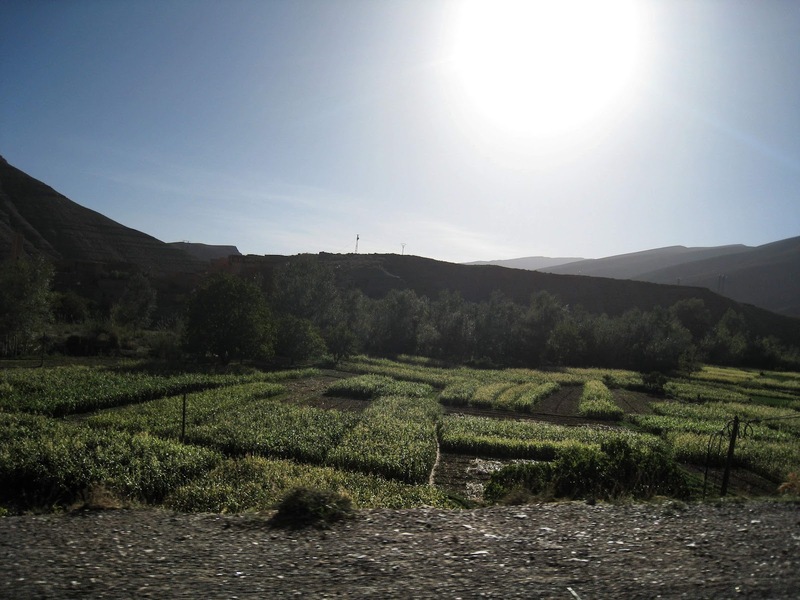 It was a two day, 400km journey through the High Atlas mountains which is a very beautiful and often winding route. We started the day by going to a famous old casbah which had been heavily restored to its 14th century glory. It was set up a bit like a museum so they had many old artifacts that they told us all about. 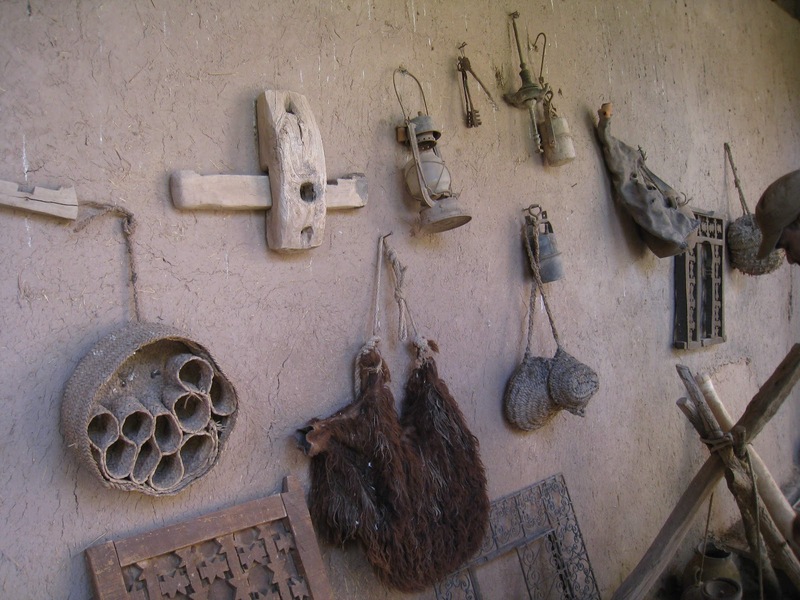 Some of the really interesting ones included wooden locks and keys, a traditional bread oven, and olive presses. It was very informative and neat to see. The casbah itself is pictured on the old 50dh bill, which I can't find online. We drove past a big golf course which felt very out of place in the dry and brown surroundings. We drove through a palmerie where the trees were giant and they made very interesting fences and things out of the palm leaves. We then drove through the Valley of the Roses. Unfortunately it wasn't the right time of year for all the roses to be in bloom, but when they are it is apparently breathtaking. 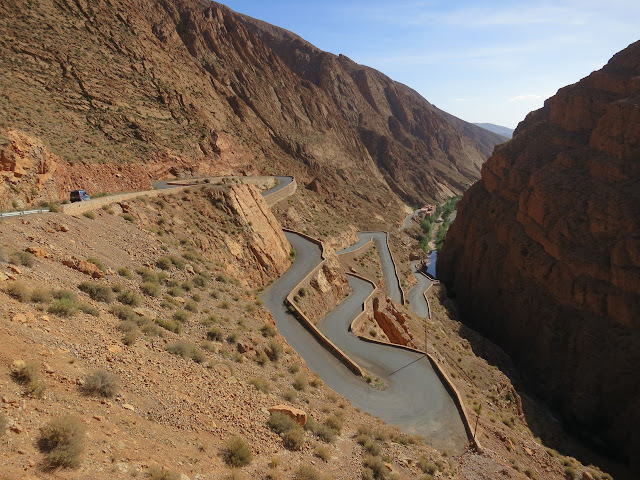 One of the great things about doing this journey was that we got to see two famous gorges in Morocco - The Dades Gorge and the Todgha Gorge. 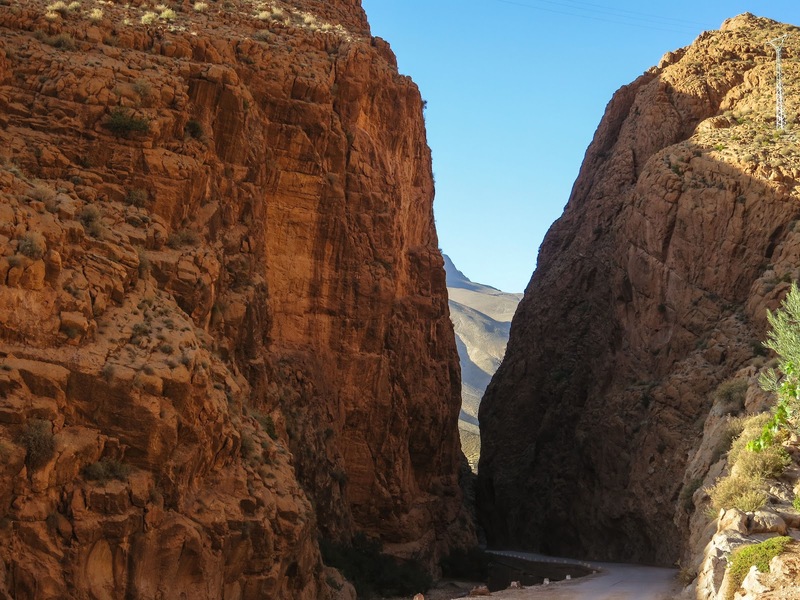 The Dades Gorge is a very famous mountain pass with high walls, and an extremely winding section of road leading to it. The picture at the top of this post is of that road. It can be seen in car commercials. We walked along the bottom of the gorge, and drove along the valley for quite a while. There is a river flowing along the middle of the valley so that is where all the crops are grown. It is very beautiful with the tall red rocks on each side of lush green crops. We then stayed over near Tinghir at a really great casbah called Chez Pierre. It was really awesome especially for seeming to be in the middle of nowhere. And the food was great! They also had a swimming pool that was excessively cold! The next day we set out really early since we had the longest stretch ahead of us, and the driver was feeling nervous about finishing the drive before dark. We started the day by going out to the Todgha Gorge which is another big and well known gorge. It was just as beautiful as the Dades Gorge. It is very well known by rock climbers and we saw a whole pack of them scaling one of the faces! The rest of the drive was a succession of beautiful vistas as we drove up and down and around in the mountains. 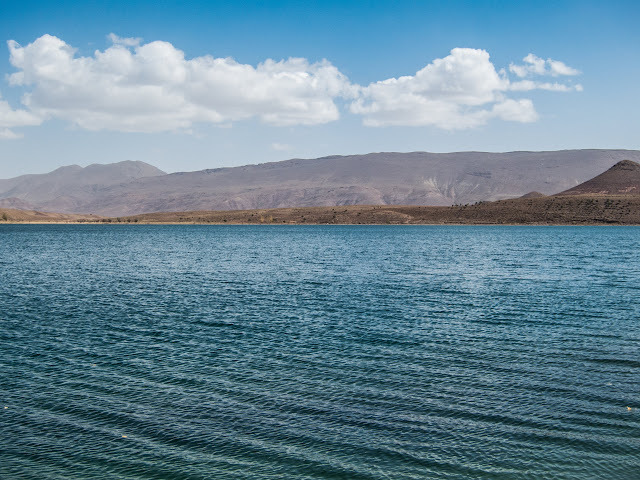 At one point we came across a huge lake which was gorgeous and felt transplanted among all the rock. and in the middle of the mountains. We made it to Meknes before dark and without any problems. We saw some interesting vehicles on the way too. Many farm trucks seem to have been modified to double deckers and are used to transport sheep and people back and forth! As a final note, here are a few Cadillac commercials that show you the interesting roads that we drove through. Don't worry we went very slowly and didn't do any of this crazy stuff. But the views you get of the roads from the helicopter give a great sense of how crazy the roads are.